With inspiration from my Indian friends, I always wanted to try my hands on this recipe. 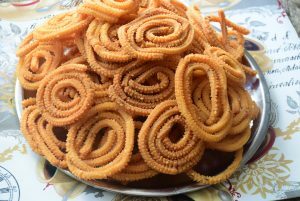 Murukku /Chakli is crispy snack made from rice -lentils flour which is traditionally made by kneading a soft dough,pressing through chakli press and then frying till crisp. I am fond of having them ,since they take me back to the pleasant memories of Andheri’s shops (Mumbai). 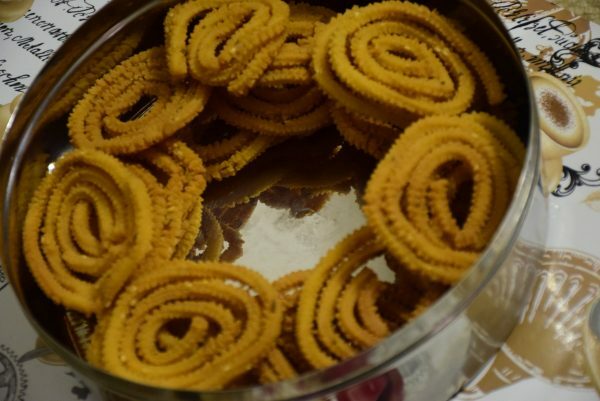 This is one of the most common ‘farsaan’ (savories) available in Mumbai. Honestly I enjoy fried ones more than the baked ones. I will share the recipe of baked ones too. 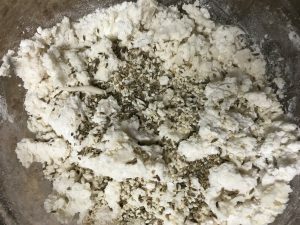 Mix the flours namely rice , urad and maida in a bowl. Add salt, pepper, cumin seeds , carom seeds, sesame seeds in the flour-mix. Make a well in the center with fingers. 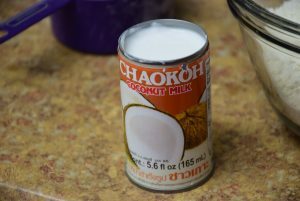 Add coconut milk in the center . You may add butter /ghee/oil too. Mix it evenly with hands. Now start adding water little by little. It does not need much water to bind. 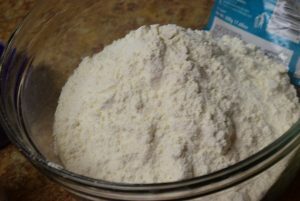 Make a soft dough with water and don’t knead it. Cover it with a wet muslin or cotton cloth. Heat oil in a wok (kadhai)for deep frying. Instead of mixing flours , you may use ready-to-mix flours available in MTR or K-Pra brand too. 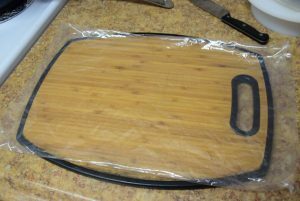 Now smear oil on a parchment paper or a plastic bag. Add the soft dough in murukku press/sev/gathiya press. Attach the one star -holed cover at the bottom. Oil the walls of the press generously. 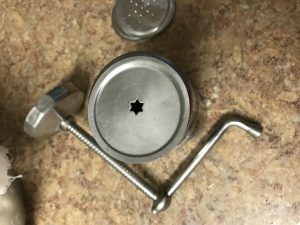 Close the lid, and start turning the knob in clockwise direction, till it turns with friction and needs more muscle power. At this point, the dough will start coming out of the hole at the bottom with serrated edges. 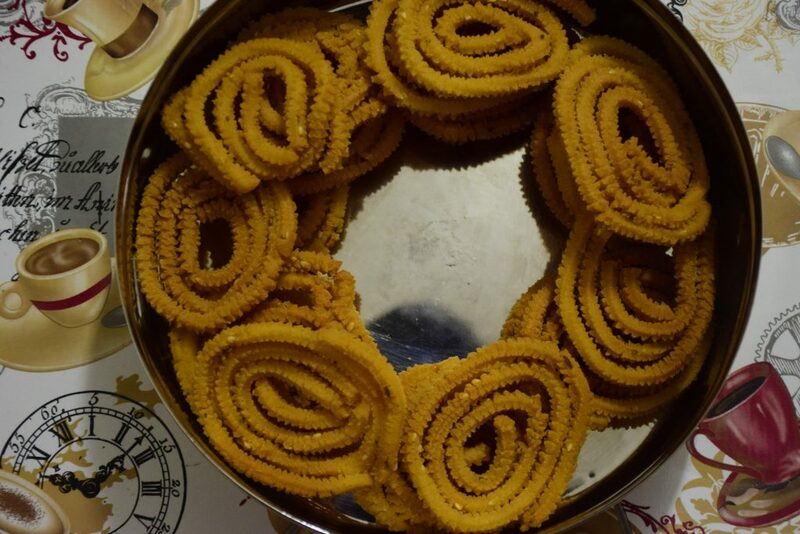 Now keep turning from top and revolving it slowly from the bottom to form a spiral shape Chakli. Keep on adding layers as many as you wish or as big chakli you want to make. 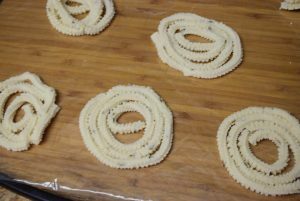 Once done, lift off the press, cut the dough with hands and stick the loose end on the chakli. In the similar way, keep pressing as many shapes as the dough could make. 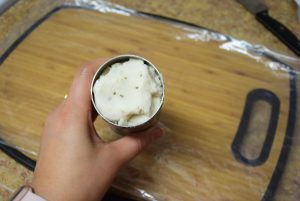 Test the oil by dropping a piece of dough in it. If it gets burnt instantly, the oil is too hot; lower the heat. 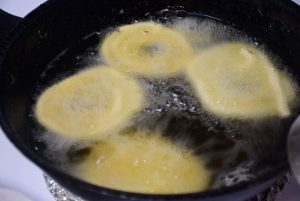 If it takes more than 2 minutes to fry , it is too low; increase the temperature. 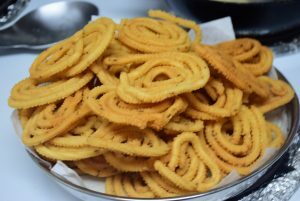 Once the oil is ready, gently flip the chakli on your palm and slid in the wok from the side. With a slotted spoon , splash little oil on it till it is fully inside the oil. Don’t touch the murruku with spoon or flipper now. Let it fry till you see slight change in color. Flip on the other side gently and fry on medium -low heat. The core has to be cooked well, so you need to fry on low temperature such that you don’t burn the edges and it gets cooked from the inside too. Don’t wait till brown color, wheatish brown color is enough, since it gets darken a little after taking out. So take them out slowly with a slotted spoon ,draining the excess oil back in the wok in a paper-towel lined plate. Let them cool on their own at room temperature and then check the core. If it is properly cooked, you will hear the crunch on breaking it, and won’t see any white dough inside. Store them in air-tight containers and enjoy till they last. 😀 Yes they get over quickly and are very addictive. Enjoy and share your experience with me ! Now start adding water little by little. It does not need much water to bind. 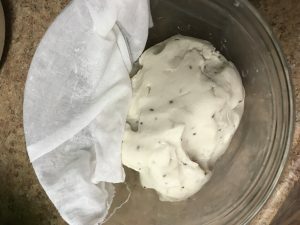 Make a soft dough with water and don't knead it. Cover it with a wet muslin or cotton cloth. Once the oil is ready, gently flip the chakli on your palm and slid in the wok from the side. With a slotted spoon , splash little oil on it till it is fully inside the oil. Don't touch the murruku with spoon or flipper now. Let it fry till you see slight change in color. Flip on the other side gently and fry on medium -low heat. The core has to be cooked well, so you need to fry on low temperature such that you don't burn the edges and it gets cooked from the inside too. Don't wait till brown color, wheatish brown color is enough, since it gets darken a little after taking out. So take them out slowly with a slotted spoon ,draining the excess oil back in the wok in a paper-towel lined plate. Let them cool on their own at room temperature and then check the core. If it is properly cooked, you will hear the crunch on breaking it, and won't see any white dough inside. 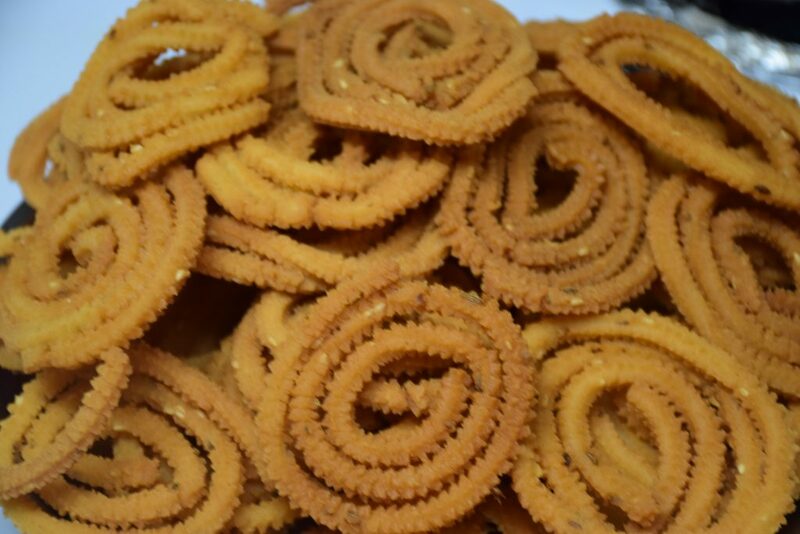 This entry was posted in Food, Recipes, Snacks and tagged addictive, ajwain, ajwan, Bhajni, Carenshare, carom seeds, Chakli, chakli press, chawal ka atta, coconut milk, crisp, crunchy, cumin, delicious, farsaan, farsan, Fried, indian snack, jeera, kadak, lentil flour, Maharashtrian, maida, mirch, Murruku, namak, peanut oil, rice flour, safflower oil, savory, sev press, shweta jindal, smacking, South-Indian, tikhat, Til, Urad flour, white sesame seeds, with tea, zindagisikhati.